To much surprise, no one lost their life as a result of the incident. Two motorists in Voronezh, Russia, are lucky to be alive following a freak November 22 accident triggered by a runaway tire. Dashcam footage shows the wheel in question rolling from the Scania truck around 0:14 before striking a Ford Focus seconds later. In attempting to swerve and dodge the tire, the actual collision with the wheel forced the Ford to overcorrect and launched the vehicle into the opposite lane. The impact from the two vehicles crashing then forced the lorry onto the guard rail, causing the truck to eventually burst into flames. According to reports, it is suspected the gas tank burst into flames from friction associated with the rail. The owner of the footage tells Viral Hog that only the 47-year-old driver of the Ford Focus was taken in for medical attention. A pet bearded dragon left a man hilariously screaming for help from a child as it climbed along his body and headed towards his face. 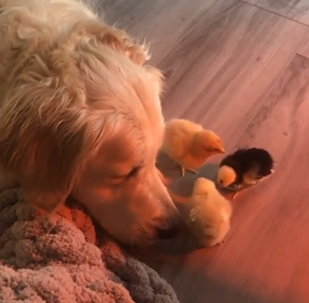 This golden retriever was clearly excited by her interaction with a cluster of chicks, rubbing its face against them and staring with interest. No stumbling while you slumber!